Well my seventh week in Gaza has come to a close and as I sit here with a sand storm lashing Gaza outside and whistling through my window, I am wondering what I have achieved ? Sometimes it feels like Dabke, the Palestinians national dance, should be two steps forward and one step backwards. However after some soul-searching I realise these solidarity projects are always an emotional rollercoaster and we are making progress shaway shaway, aka step by step – thanks in large part to the dedication and commitment of the Gaza Ark steering committee here in Gaza and internationally. Maybe the reflection has been brought about by the fact I am a long way from home on the eve of my birthday and I am missing my peeps, who I now havent seen for almost five months. – but what ever the cause it is always good to take stock. I know I have been saying this for week or two now, but we are close to purchasing the vessel that the Gaza Ark project will refurbished to sail across the mediterranean in an attempt to open the only port in region closed to shipping, and in the process hopefully establishing a vitally important trade route for the besieged Palestinians of the Gaza Strip. Contacts have been negotiated, drawn up and translated – all that remains before the purchase process is complete is for one final inspection to be undertaken before we sign on the doted line. The highlight of my week however was meeting Haidar Eid, who amongst other commitments, is on the Gaza Ark Advisory Committee. He is also an Associate Professor of Postcolonial and Postmodern Literature at Gaza’s al-Aqsa University, a member of the Palestinian Campaign for the Academic and Cultural Boycott of Israel [PACBI] Steering Committee and a co-founder of the One Democratic State Group. Haidar is incredibly insightful and sharp and he spent the afternoon schooling me on all things Palestinian, hopefully it was the first of many lessons from Haidar while I am in Gaza. This week also saw a visit to Palestine by Barack Obama, his itinerary and speeches laid bare the double standards of the US position on the occupation and discrimination that Palestinians endure. Describing Israel’s settlements in the West Bank as “inappropriate”, not illegal. Talking about a two state solution, which fails to address the discrimination of the 1.5 million Palestinians residents of Israel – not to mention the right of return that has been denied to over 5 million Palestine refugees. As Ali Abunimah pointed out this week on twitter > There is no “two state solution” to the problem of Zionist racism and land theft. During his visit Obama’s often talked about the shared values and similarities of the US and Israel, this might have been the most honest thing he said all week, as both countries are colonizing entities that committed massacres and ethnic cleansing of the population indigenous to the land they settled on. The double standards in the US foreign policy on Palestine are also reflected in the mainstream media. For example, Israel has, on average, breached its November ceasefire with the Palestinians at least once a day. Resulting in the death of 10 Palestinians and injury of nearly 700. However the mainstream press would have you believe that the ceasefire was only broken on the 26 February 2013 when a single rocket was fired from Gaza into Israel and resulted in a damaged Israeli road. The deaths of Palestinians didn’t rate a mention in the mainstream media, but a damaged road in Israel is news worthy ??? 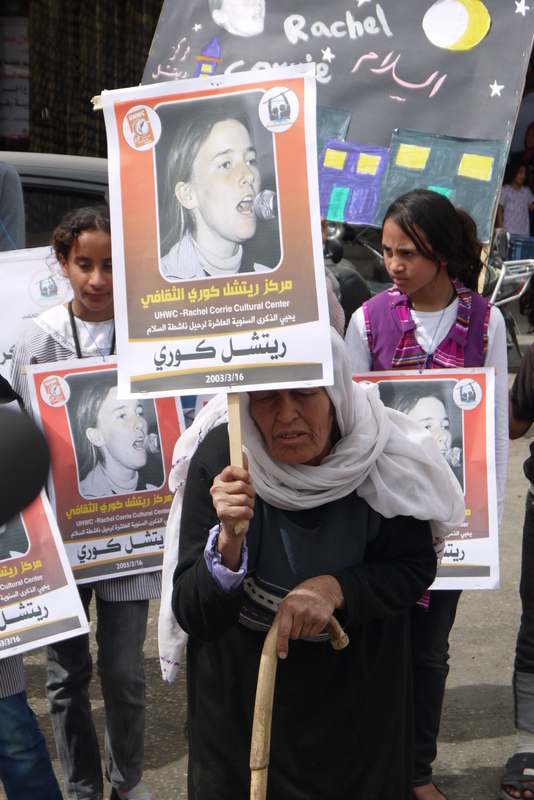 Rally in Rafah to commemorate the10th anniversary of Rachel Corries murder by the IOF. My time in the Middle East has only reinforced my beliefs that there is a double standard when it comes to the Palestinian-Israeli conflict, not to mention a fair amount of miss information. This double standard is evident in both media reports and international political responses to the situation and are most clearly evident in reports and responses to the Oslo peace process and 2006 and 2009 invasions of Gaza. In 2006 after an Israeli solider was “kidnapped” by Hamas, Israel was given cart blanch by the media and foreign governments to address the situation as it saw fit – under the auspice of security. However every night Palestinians live with Israeli incursions and arrests, yet Hamas are given no means of recourse by the media or foreign governments. Even the language used to describe the same activity – Hamas “kidnaps” Israeli’s and Israel “arrests” Palestinian “suspects”, lets not forget that Hamas is also a democratically elected government. A democratic government that Israel and America has stated aims to overthrow, their justification for this is that Hamas does not recognise Israel’s right to exist – pointing to the Hamas charter and ignoring the fact that Hamas has repeatedly called for negotiations on a long term cease fire and a two state settlement. An offer ignored over and over again by Israel and the United States. When Hamas kill civilians, they are labeled terrorists – and rightly so, as any targeting of civilians is in my book terrorism. Compared to when Israel kills civilians, it’s labeled an accident and justified by security concerns. Who has the more advanced military and therefor should be less likely to make mistakes ? And who really has security concerns ? Considering a 2007 United Nations report by the Office for the Coordination of Humanitarian Affairs [OCHA] reported that since the beginning of the second intifada in September 2000 until the end of July 2007 at least 5 848 people have been killed as a consequence of the Israeli-Palestinian conflict. Of those 5848 deaths, 4228 where Palestinians, 1024 where Israeli’s and 63 where foreign citizens. Meaning Palestinians are dying at a rate of over four to one compared to Israeli’s. In 2008 Israel’s blockade of Gaza – a form of collective punishment outlawed under international humanitarian law – kills around 300 Gazains as a result of a lack of access to medical treatment, again Hamas are given no means of recourse. However Hamas rockets kill three Israeli’s and the international community again sees this as justification for killing over 1000 Palestinians and injuring many more. Unfortunately the Australian governments response to the 2009 invasion of Gaza showed this double standard at it’s clearest. While condeming Hamas rocket attacks that had killed three Israeli’s, they only expressed concern over the Israeli military action – which at that stage had killed around 750 Palestinians. What happened to equality ? A human life is a human life, no matter what side of the apartheid wall you live on. The media so often portray Israel as the innocent victims of this conflict and the Palestinians the terrorist aggressors, personally I have found the opposite. I have heard on several occasions Israeli’s speak positively about Palestinian deaths. While during my time in Nablus and the occupied terrirories I never heard Palestinians speak positively of Israeli deaths. I did though hear many people in Nablus and the occupied territories express their understanding of Hamas actions and in many ways I can see their point of view. Israel as the creator of the extreme situation, must accept some of the responsibility for the extreme behaviour that this situation creates. Even the reporting on the failed Oslo peace process shows these double standards. It was widely reported that the Palestinians walked away from a generous Israeli offer of self determination, East Jerusalem, all of the West Bank and Gaza. This was not the case, what was on offer at Camp David was 10 small Palestinian enclaves- not connected to one another. In addition to this Israel would still control the population registers of these enclaves – determining who can live where and who can travel and when. Plus the Israeli’s would maintain control of the water, maintaining the current distribution ratio – where in the West bank 20% of the water goes to the Palestinians who make up 80% of the population. In addition to this Israel would still control the air space above the enclaves, fertile farming land was to be swapped for arid desert, Israel would still control Jerusalem and there would be no right of return for Palestinian refugees – called for by several UN security council resolutions. Does not sound so generous to me and I certainly would not call it self determination, even one of the Israeli negotiating team, at Camp David, latter stated that if he where “Palestinian he would not have accepted the deal”. Also take into consideration the fact that the whole way through, the so called “peace process”, Israel had expanded settlement construction in contradiction to it’s obligation under the Oslo agreement – settler numbers in the West bank doubled to nearly 500 000 during the peace process. Even the conditions placed on the Palestinians by the international community, namely the US, to restart negotiations about a two-sate solution show this double standard. The Palestinians have to recognise Israel’s right to exist, renounce violence and accept the road map to peace – three conditions that are not placed on Israel. Israel definitely does not except Palestine’s right to exist, the 2006 and 2009 invasion of Gaza clearly show they have not renounced violence and the fact they continue to expand their settlements in the West Bank show they do not accept the conditions of the road map to peace. The Palestinian refugees are so often the forgotten victims of this conflict, they have in some cases been refugees for over 50 years and as we know from our experience in Australia the physiological effects of refugee status can be dramatic. The effects of living in fear and limbo, of family separation, of lack of access to rights and services are quite well documented in Australia after only several years, Palestinians have been living like this for generations, and again are given no means of recourse through international institutions or the media. So with all this evidence of misinformation and double standards, the question has to be – why ? Who benefits from this miss information and double standards ?